One of the oldest fruit-bearing plants in cultivation. Plants can easily be trained to a tree form or espaliered against a wall or fence. 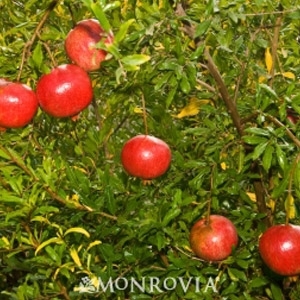 Pomegranate plants have small oval leaves, and are somewhat thorny. They require full sun, tolerate alkaline soils, summer heat, and winter lows to 10 degrees F. Pomegranates are somewhat drought tolerant, but should be irrigated similar to other fruit trees for optimum fruit quality. Deciduous.